The company was fortunate to acquire the Old Wesleyan Chapel in Ferry Street in 1997 but the building was in a poor state of repair and it required a considerable amount of money in order to bring it up to a good standard. This was achieved through the generosity of various charities and many fund raising events.In 2013 the whole roof, which was in a poor state, has been removed and re-fixed – the funds to pay for the work were been generated through our “Raise the Roof” campaign topped up with a generous grant from Burton Consolidated Charities. 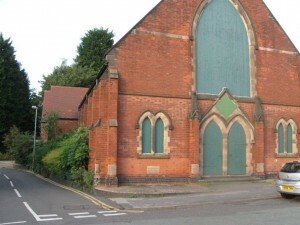 The building has two large rooms – the school room is now used as the main rehearsal room and the chapel for storage and construction of scenery and also has an area used for dance rehearsals. The building is located on the corner of Ferry Street and The Dingle. The main entrance to the building is from The Dingle at the rear of the building. Car parking is on street and is limited, however, members are allowed to park on the garage forecourt opposite provided that the access to the garage is not blocked.